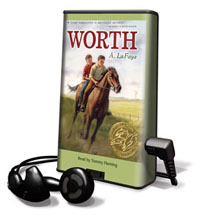 Crippled by a freak farming accident, 11-year-old Nathaniel is bitter, helpless, frustrated, and angry when his father brings John Worth, an Orphan Train boy, into their home to help with the chores Nate can no longer manage in A. LeFaye's novel. But the two boys, each wounded in a different yet similar way, discover they have more in common than initially apparent and slowly begin to develop a friendship based on their joint desire to save the family's farm. LaFaye's unsparing look at the grueling hardships of day-to-day farm life during the late 19th-century and the ongoing battle between farmers and ranchers for control of the land is matched by the narrator Tommy Fleming's skill at portraying the starkness of the emotions felt by each of the characters in this short, spare, and beautifully told winner of the Scott O'Dell Award for historical fiction. Speaking with an authentic Nebraska accent, Fleming captures the poignancy of Nate's battle to overcome his disability, learn to read, and reinvent himself within his unhappy family. A compelling and historically accurate story beautifully rendered.